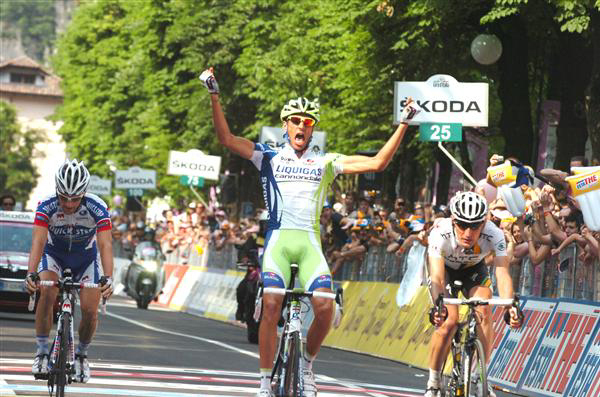 Note: On February16, 2012 the Court for Arbitration of Sport stripped Contador of his Giro victory. The top ten GC reflect recalculated times. The rest of the times are as of May 29, 2011. Bjorn Selander (Radio Shack) s.t. Klaas Lodewyck (Omega Pharma-Lotto) s.t. Gert Dockx (Omega Pharma-Lotto) s.t. Bart De Clercq (Omega Pharma-Lotto) s.t. Olivier Kaisen (Omega Pharma-Lotto) s.t. 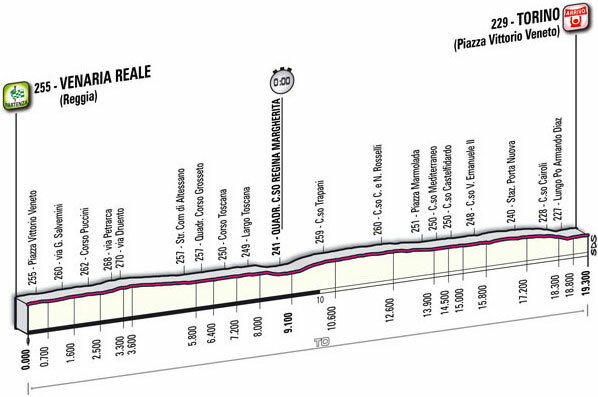 Stage 2: Sunday, May 8, Alba-Parma, 244 km. 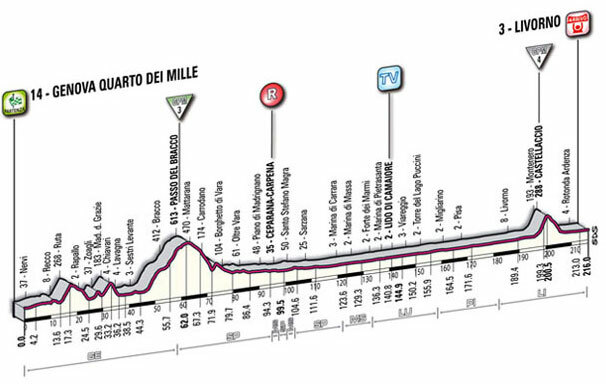 Longest stage in 2011 Giro. 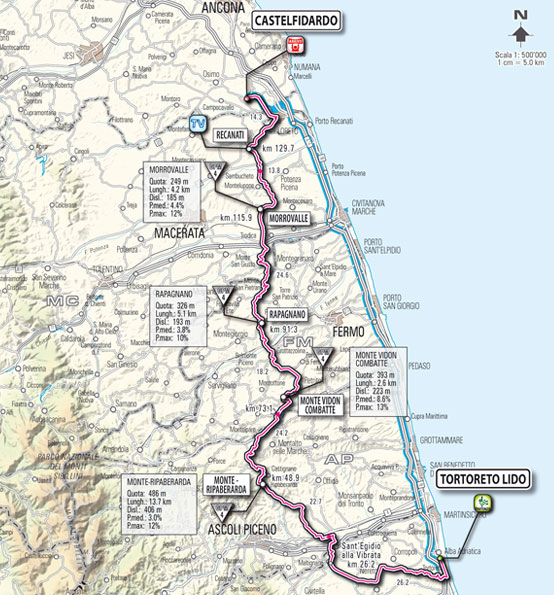 The race: At km 3 Omega Pharma-Lotto rider Sebastian Lang took off, riding solo for more than 200 km, becoming the virtual maglia rosa with a lead that grew to be over 18 minutes before getting reeled in. Other breaks were then attempted, but the sprinters were not to be denied. 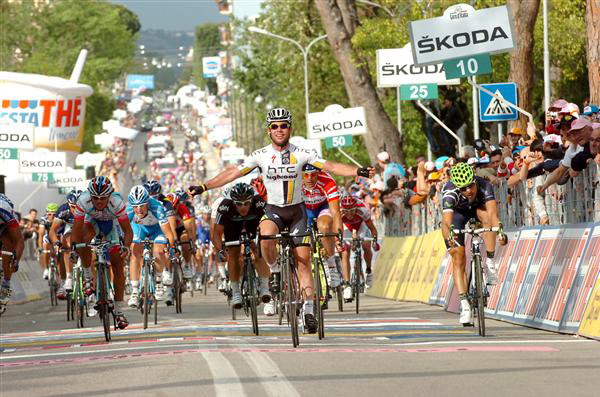 Alessandro Petacchi took the stage and Mark Cavendish become the new Pink Jersey. Cavendish protested that Petacchi hadn't held his line. 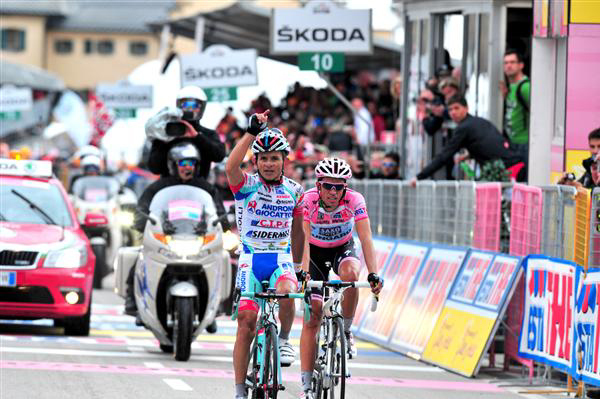 Petacchi's stage win was upheld. 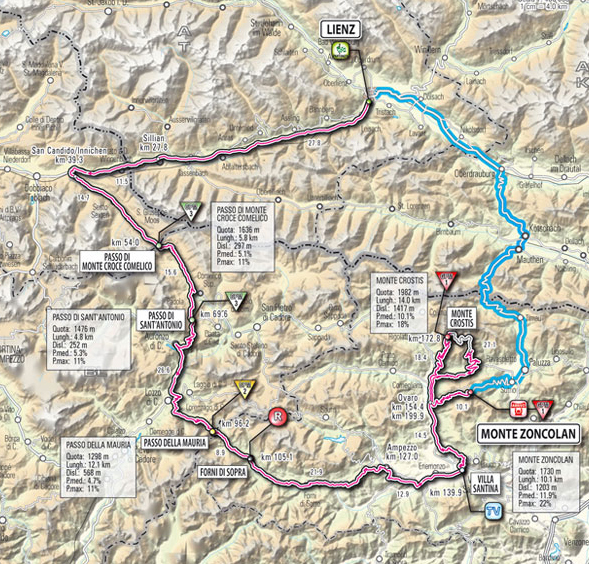 The Race: Wouter Weylandt (Leopard-Trek) died after crashing on the Passo del Bocco, a very technical descent. Presentation ceremonies were cancelled. Pablo Lastras Garcia (Movistar) s.t. Gerald Ciolek (Quick Step) s.t. 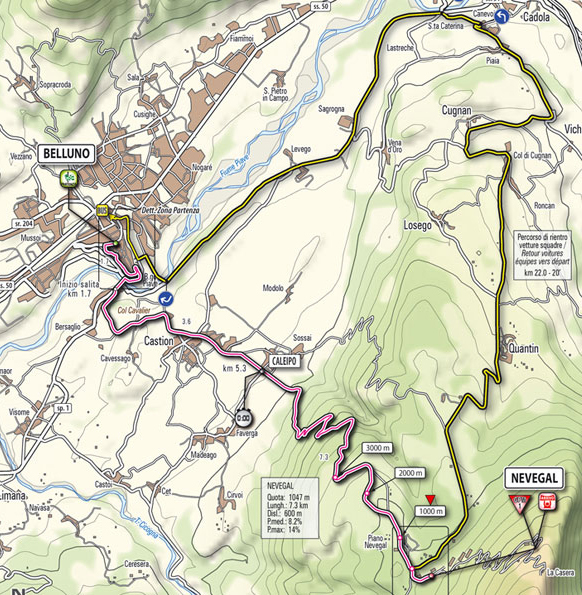 To honor Wouter Weylandt, whose tragic death in stage 3 has shaken the entire cycling world, stage 4 will be neutralized. It will start with a minute's silence and will end with Weylandt's team, Leopard-Trek, crossing the finish line first. 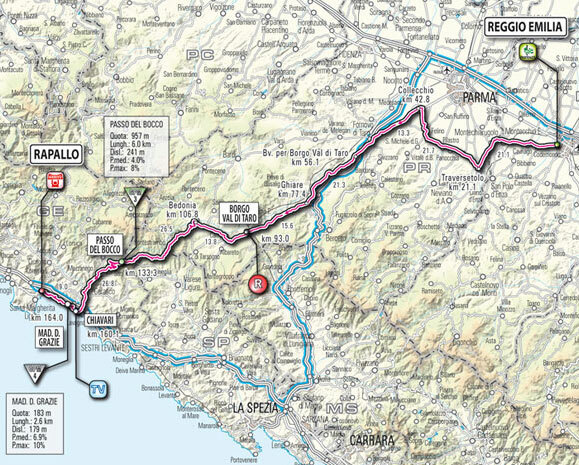 After completing stage 4, Leopard-Trek has decided to withdraw from the Giro. 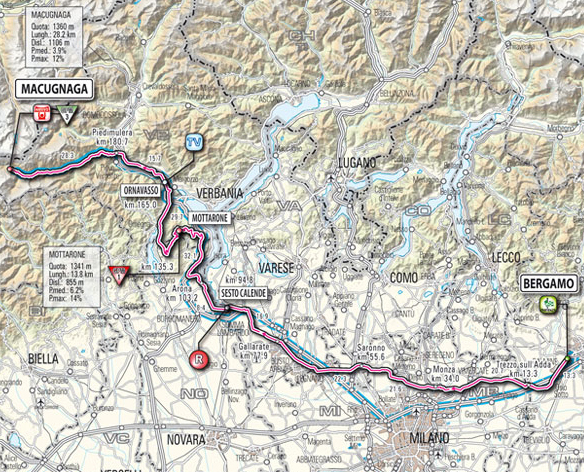 Garmin-Cervelo rider Tyler Farrar is also leaving. 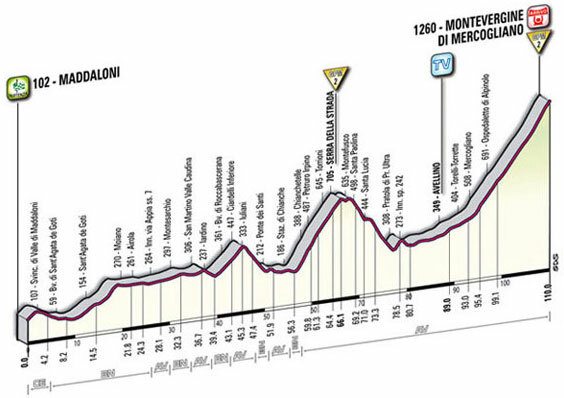 The Race: After last year's spectacular (and incredibly difficult, wet and muddy) day on Tuscany's gravel roads, the Giro had put in in another dose of white roads in 2011. 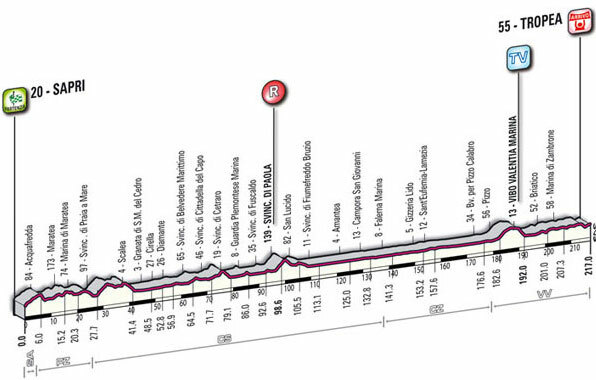 This year there were 19 kilometers of strade bianche. Martin Kohler (BMC) took off almost at the gun and was still away when Pieter Weening (Rabobank) and John Gadret (Ag2r) bridged up to him with about 10 km to go. Weening had plenty of suds and soon left his companions. He soared up the tough climb to Orvieto (which sits at the top of a high mound of tufa) and held of the rampaging hoard for a nice solo win. 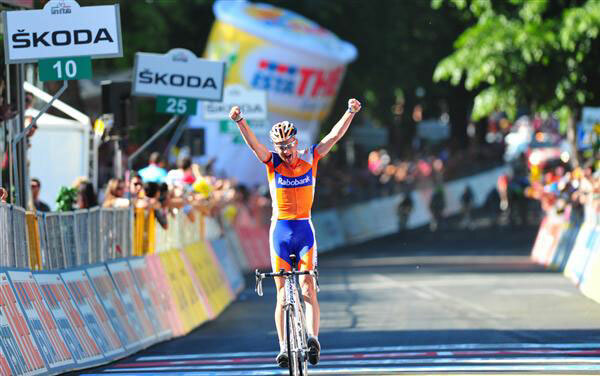 Mikel Nieve Ituralde (Euskaltel) s.t. 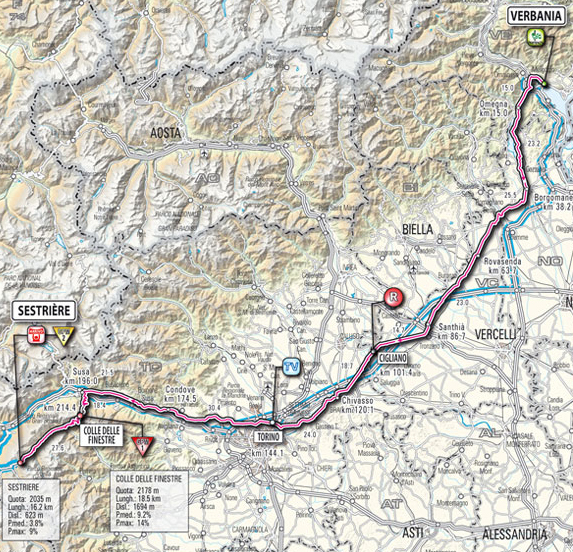 The Race: There was a buccaneering break that took off about 15 kilometers into the stage. The break hung on till about 40km to go, then it began to come apart and was sucked up, with the exception of Quick Step rider Kristof Vandewalle. He stayed away until there were less than 2 kilometers to go. 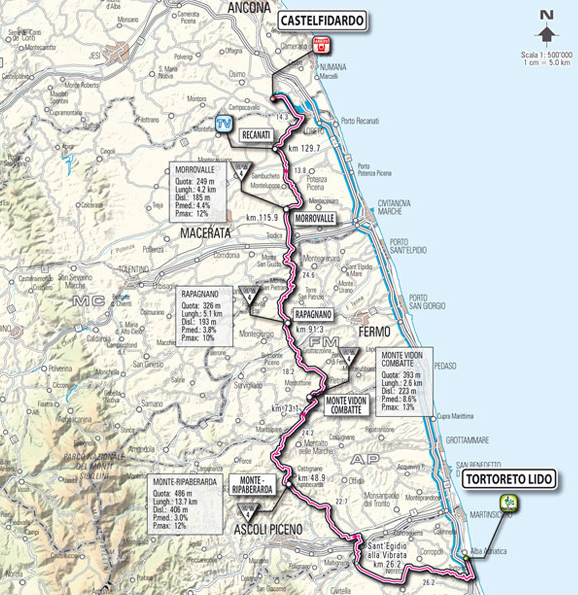 Alessandro Petacchi and Francisco Ventoso drag-raced the uphill finish with Petacchi at a disadvantage whenever the road goes up. Roggero Marzoli (Acqua & Sapone) s.t. Fabio Andres Duarte (Geox) s.t. 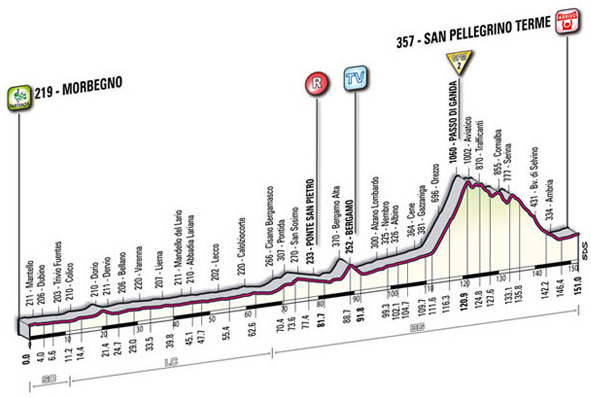 The Race: A 5-man escape took off early in today's short stage and managed to stay away until the lower reaches of the final climb, the 5% gradient Montevergine di Mercogliano. There, Omega Pharma rider Bart De Clercq jumped, hoping to make contact with the riders still up the road. He blew by them while the peloton remained disinterested. Towards the top things heated up in the packand De Clercq barely hung on for the stage win. 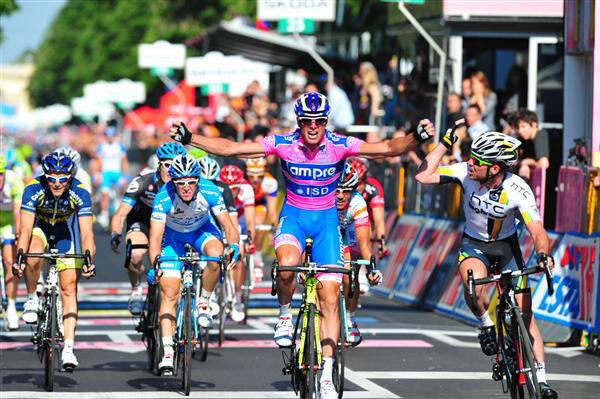 Maglia Rosa Pieter Weening was with the front chase group and retained his lead. Stefano Gazelli (Acqua & Sapone) s.t. José Rodolfo Serpa (Androni Giovattoli) s.t. 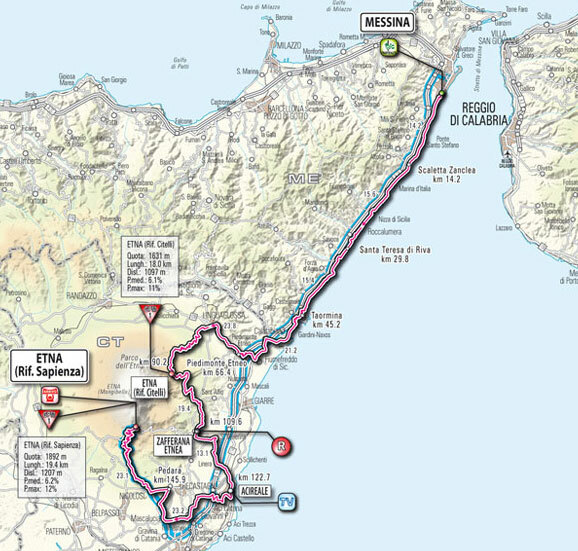 Stage 8: Saturday, May 14, Sapri - Tropea, 217 km. The Race: Again, almost from the gun a break took off, this time Mirko Selvaggi (Vacansoleil) and Leonardo Giordani (Farnese Vini-Neri Sottoli). They built up a 10-minute lead and weren't caught until about 7 km to go. 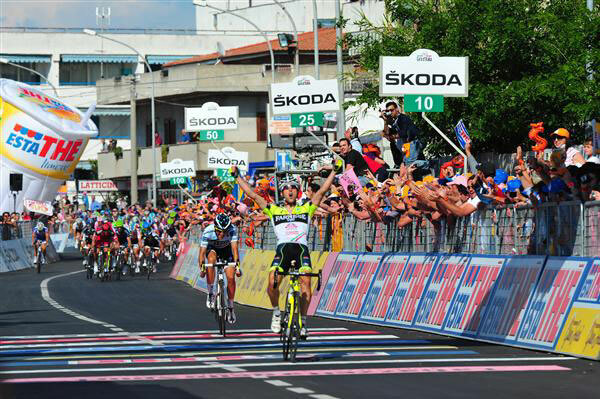 On the uphill leading to the finish, Oscar Gatto jumped away with Alberto Contador chasing. 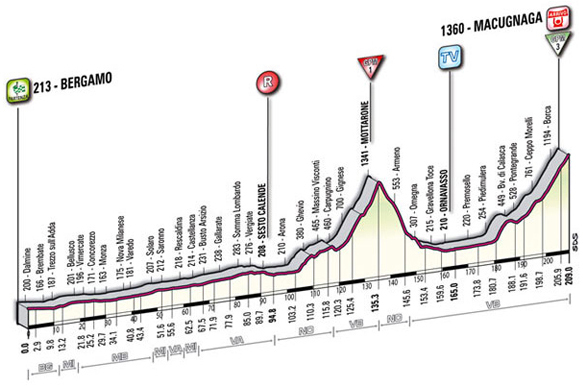 Gatto held it and the sprinters were denied a stage that was thought perfect for them. Elia Favilli (Farnese Vini-Neri Sottoli) s.t. Manuel Antonio Cardoso (Radio Shack) s.t. The Race: After various attempts to form the day's break failed, a 5-man group got it together after about 50 kilometers. But on an important day like today, they were doomed. Today had 2 trips up Mt. Etna and on the second trip up the volcano, with about 9 km to go, José Rujano blasted away. 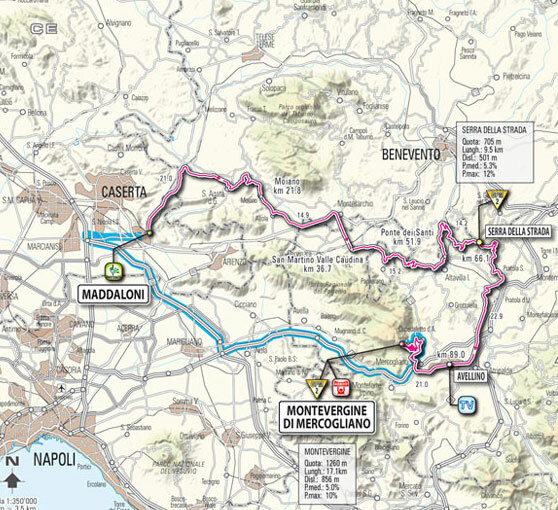 After another kilometer of climbing, Contador shot off the front with Michele Scarponi for company... for a while. 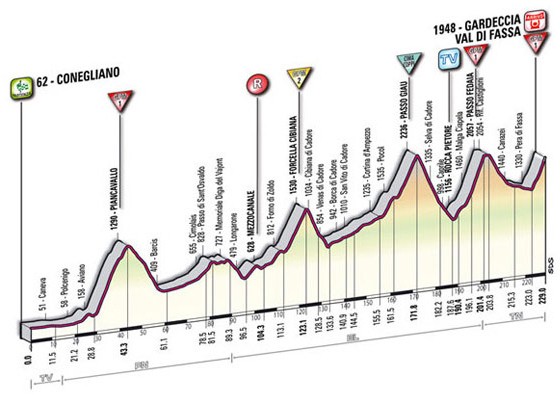 Scarponi had to surrender (he finished 12th) as the early breakaways were passed. Then it was Rujano's turn. 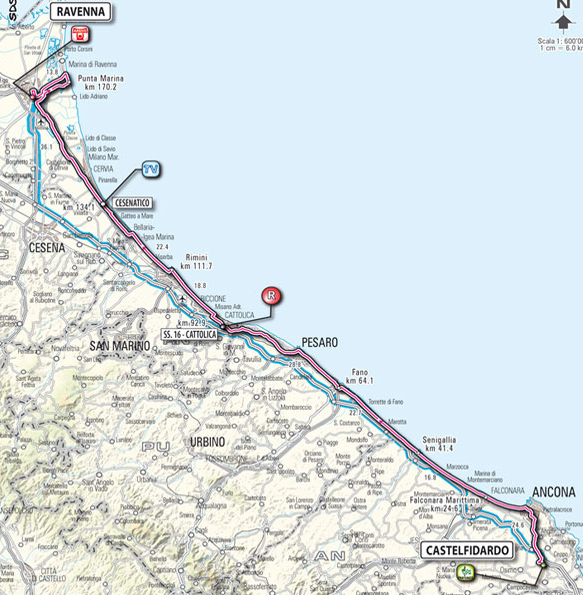 When Contador went by, he grabbed his wheel and it was only after several attacks was Rujano dropped, and not by much. See the picture above, that's Rujano onlya few seconds back. 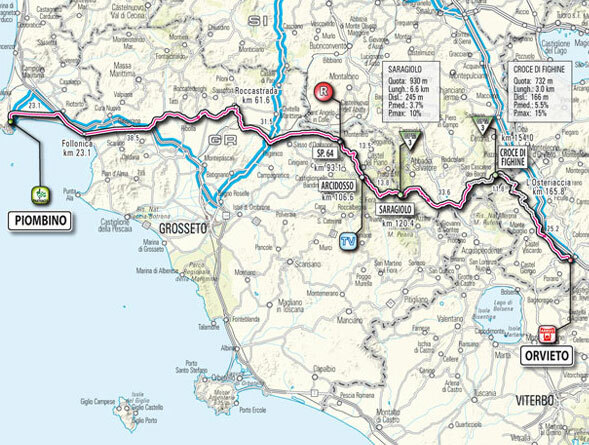 Contador in now the maglia rosa and is well on his way to winning his 6th Grand Tour (Record is 11. Merckx, of course). The Race: The day saw a trio of riders (Fumiyuki Beppu, Yuriy Krivtsov & Pierre Cazaux) leave the peloton before the stage was even a kilometer old. Their lead grew to over 6 minutes, but HTC-Highroad and Saxo kept them on a manageably short leash. 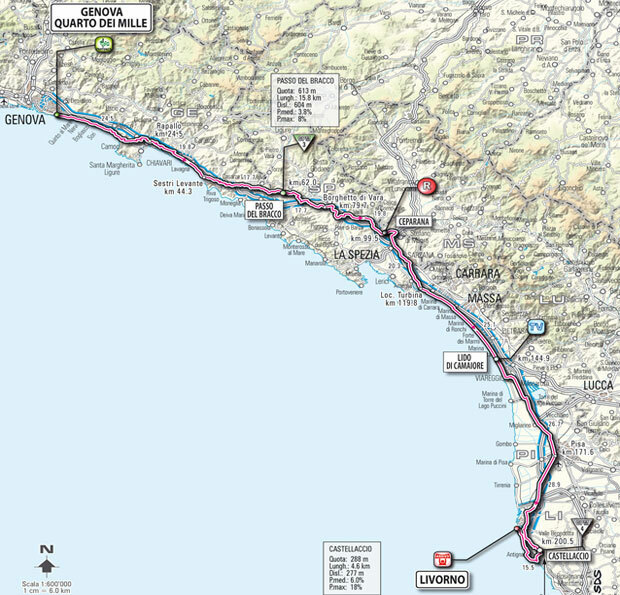 They were caught with slightly more than 10 km to go and it was gruppo compatto, but close to the finish David Millar went on a flyer. The sprinters' teams were having none of this sort of nonsense and he was pulled back with 1 km to go. 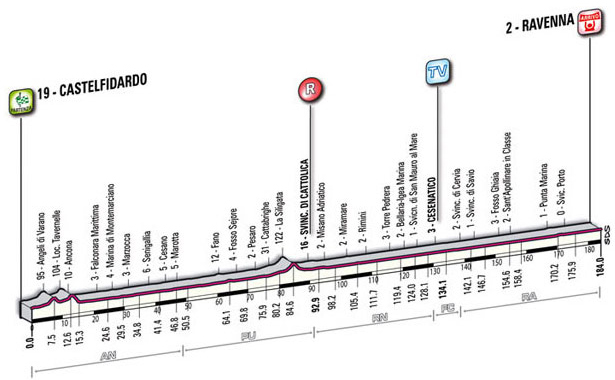 Petacchi led it out from too far back, especially since Mark Cavendish was sitting on his wheel. 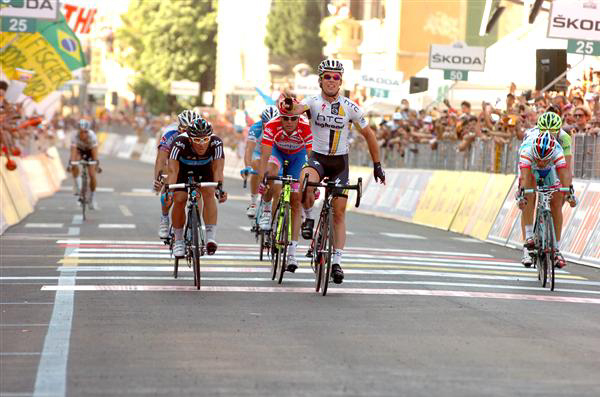 Cavendish easily took the slightly uphill finish for his first Giro win this year. Oscar Gatto (Farniese Vini-Neri Sottoli) s.t. 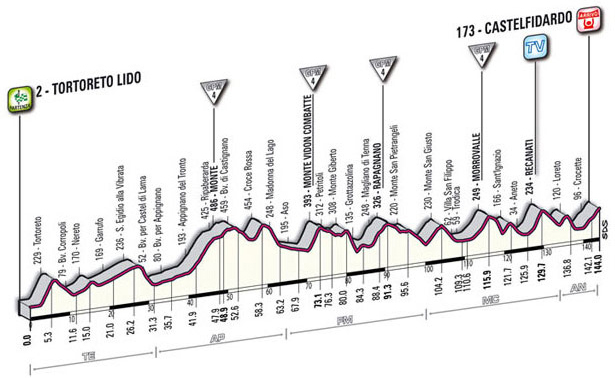 The Race: Today's stage was a short but bumpy ride to Castelfidardo. 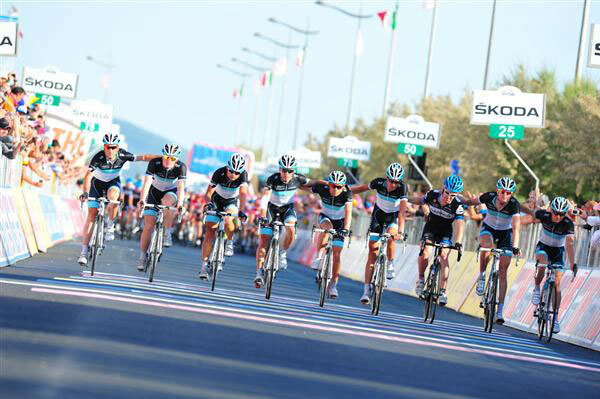 After many failed attempts to put together a combination of riders that could stay away, an 11-man group extracted itself from the peloton about 65-kilometers into the race. Interestingly, it had Christophe Le Mevel, third in GC, who ended up losing a bit of GC time and 1 place when the smoke had cleared. The break wasn't allowed much rope and never got a big gap on the pack. Daniel Moreno attacked from the break and held on to almost the line. John Gadret came flying out of the peloton on the uphill finish and was the first of 20 riders to go by Moreno. Giovanni Visconti (Farniese Vini-Neri Sottoli) s.t. Ruggero Marzoli (Acqua & Saone) s.t. 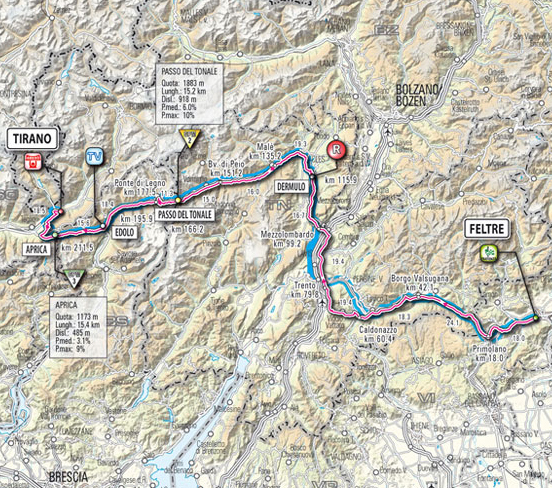 The Race: Before the day's brutal Alpine stage began, 6 sprinters, including Alessandro Petacchi and Mark Cavendish, packed their bags and headed for the airport. 50 kilometers into the stage, 16 riders escaped and stayed away until the slopes of the final climb, the Grossglockner, began to bite. Igor Anton's Euskaltel was the most evident team at the front of the chasing peloton as the escape was kept within reach. With about 10 km to go, the escapees were back in the now-reduced fold. José Rujano attempted to get away but was pulled back. Then the big move. Alberto Contador showed that he is the finest human climbing machine when he dropped the rest of the elite riders remaining in the front group, but he did it with Rujano for company. The two worked together, giving Contador another minute and a half of margin in the GC over the other contenders. 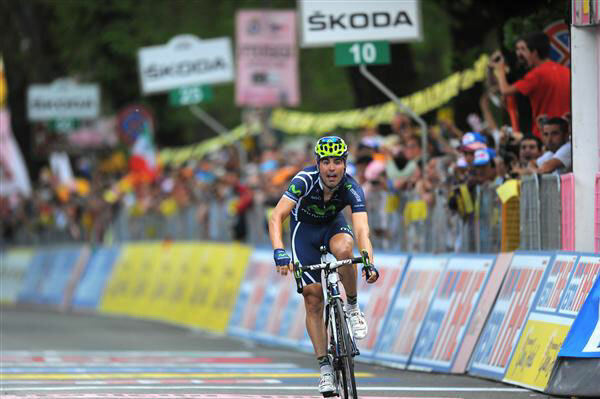 The king, content with the day's rewards, allowed Rujano to win the stage. Ivan Rovny (Radio Shack) s.t. 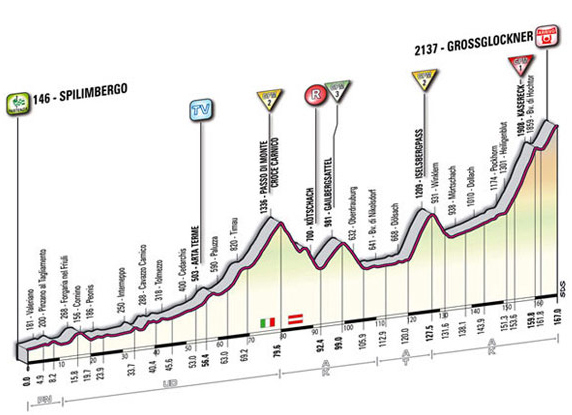 The Race: After protests from the riders and team directors (to Giro boss Zomagnan's extreme fury), the UCI ruled that the difficult descent of the Crostis was to be removed from the day's route. An ascent of the the Tualis was the planned replacement, but after learning that tifosi angered over the removal of the Crostis were planning a protest on the Tualis, that climb was also removed. That decision was made while the race was in progress. 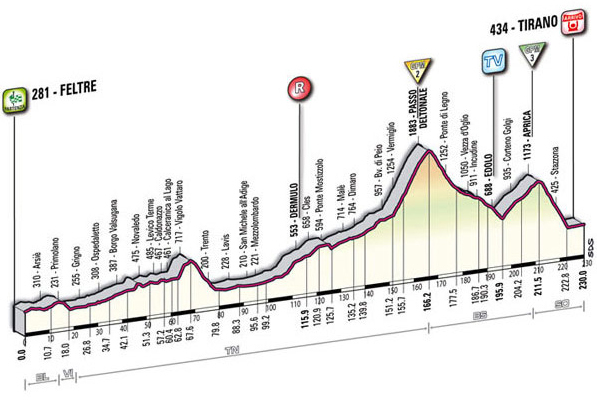 With the race shortened by about 35 km, the day's breakaway made it to the start of the Zoncolan ascent. First Katusha's Rodriguez took off, then Igor Anton blasted away, the good racers all passing the earlier breakaway riders. 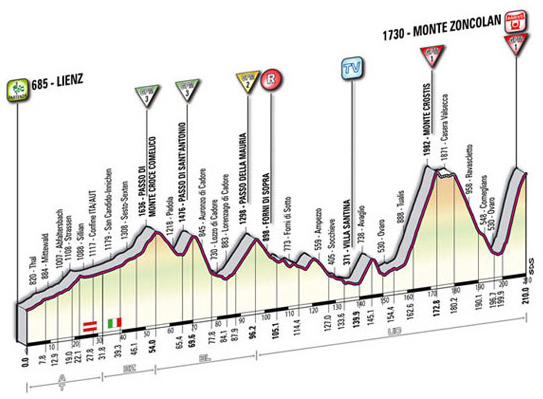 Meanwhile, Contador (packing a 36 x 32 for the Zoncolan! ), with a nice time pad, was content to sit on Vincenzo Nibali's wheel. 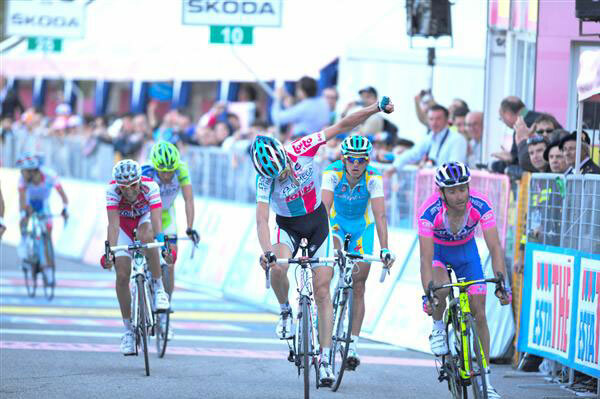 Anton won the stage and in the final meters Contador left Nibali. 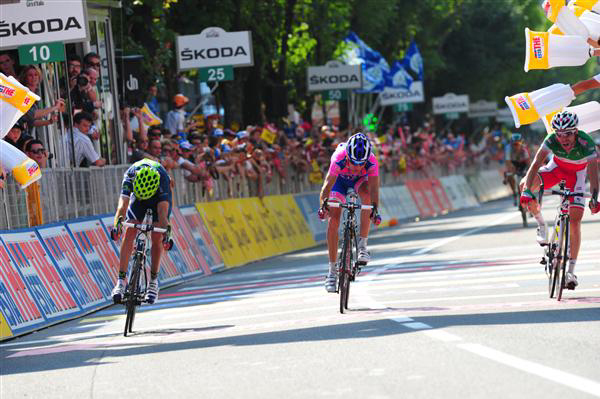 Contador still owns the pink, red and green jerseys while Anton and Nibali are separated by only 1 second. Will Contador continue to help his countryman Anton move up the standings? 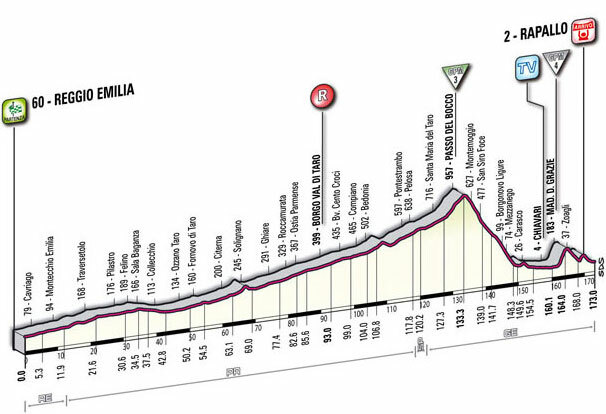 The Race: This was the Queen Stage or Il Tappone with five major climbs: Piancavallo, Cibiana, Giau (the Cima Coppi, or this year's highest point), Fedaia and Gardeccia. The day's break cleared the peloton on the Piancavallo. 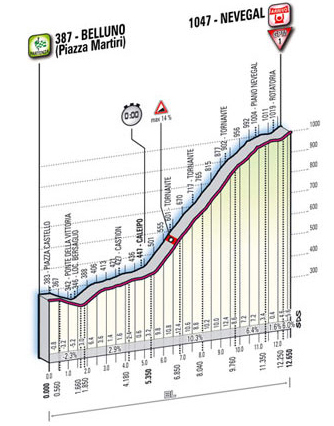 Stefano Garzelli and Mikel Nieve Ituralde left this group on the Giau, with Garzelli soloing well off the front. 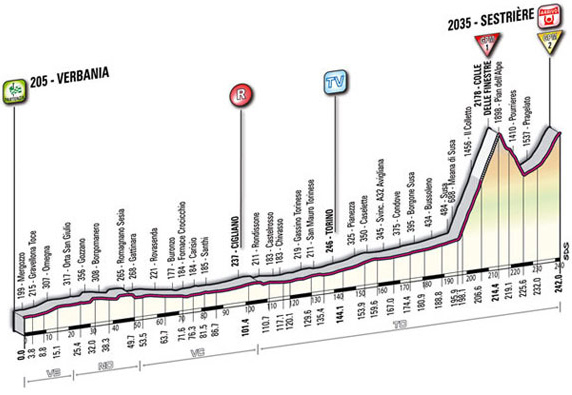 On the Gardeccia, Ituralde caught and passed him and held on for the stage win. Back in the peloton, Vincenzo Nibali was having trouble on the climbs and had to use his substantial descending skills to regain contact twice after getting dropped. 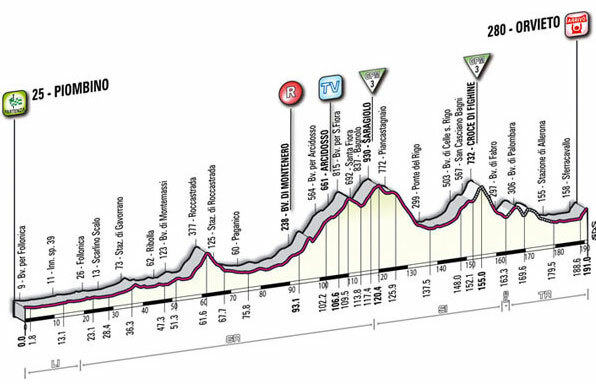 On the final climb, Contador left the small elite group of remaining riders, but could not substantially distance himself from Scarponi, who was having a very good day. Contador came close to catching Garzelli, but the 2000 Giro winner held on to second place by 10 seconds and took the climbers' green jersey as his reward. Cayetano Sarmiento (Acqua & Sapone) s.t. 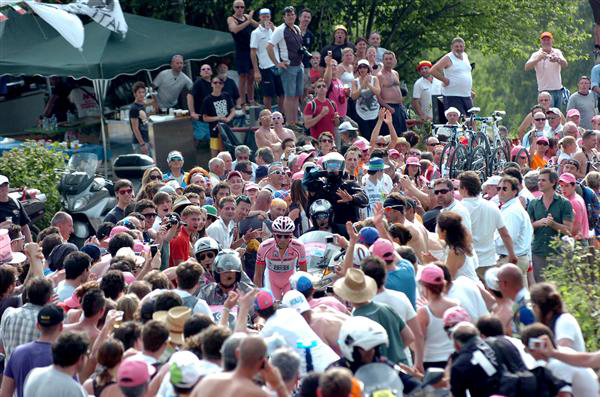 The Race: Diego Ulissi (center), Pablo Lastras and Giovanni Visconti (Jan Bakelandts can be seen in the distance in the picture above) had left the day's break behind and as they sprinted, Visconti pushed Ulissi aside and was first across the line. 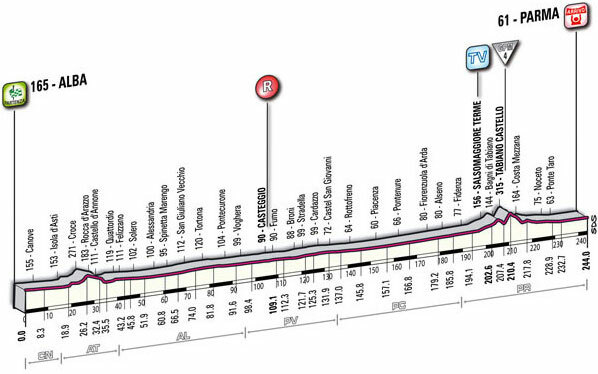 The judges relegated Visconti for irregular sprinting. Matteo Rabottini (Farnese Vini-Neri Sottoli) s.t. 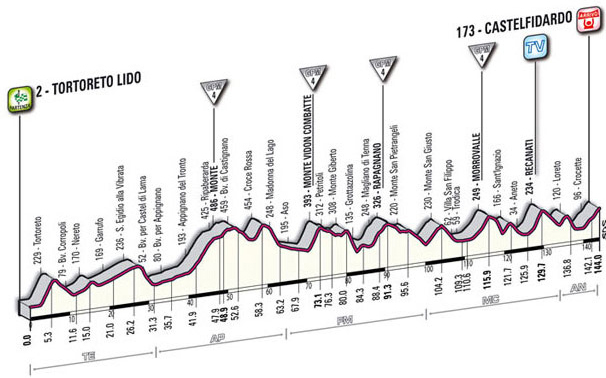 Stage 18: Thursday, May 26, Morbegno - San Pellegrino Terme, 151 km. Keven Seeldrayers (Quick Step) s.t. Carlos José Ochoa (Androni Giocattoli) s.t. 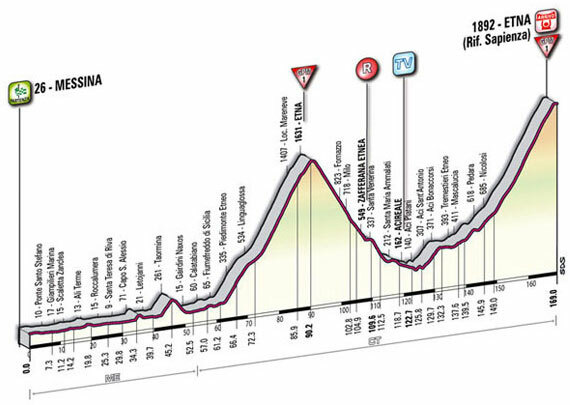 The Race: At about km, 30 a 13-rider break rolled off and when it reached the Colle delle Finestre, Vasili Kiryienka took off (while the break was shattered by the Finestre's steep slopes). José Rujano went in pursuit but no one could catch Kiryienka today. 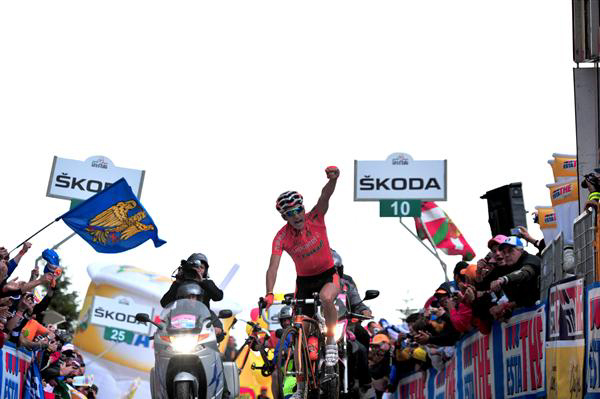 Vincenzo Nibali suffered on both of the day's ascents, needing his superb descending skills to reconnect after the Finestre. 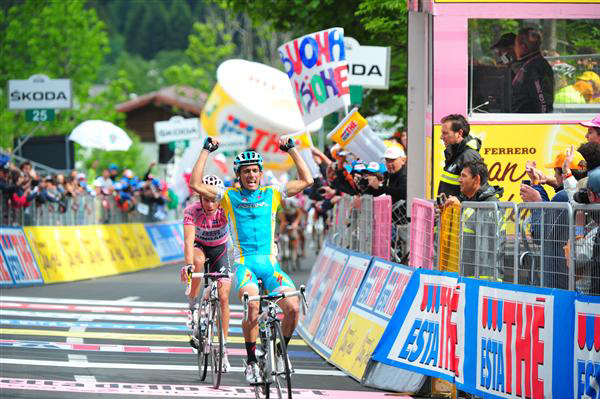 Michele Scarponi gained a little more time on Nibali today. 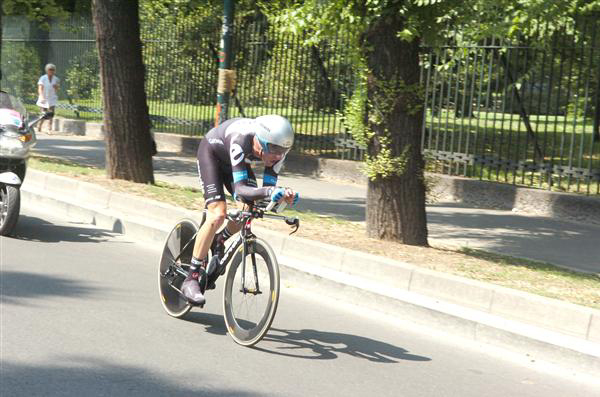 Alberto Contador easily defended his first place and now there is only the time trial in Milan. 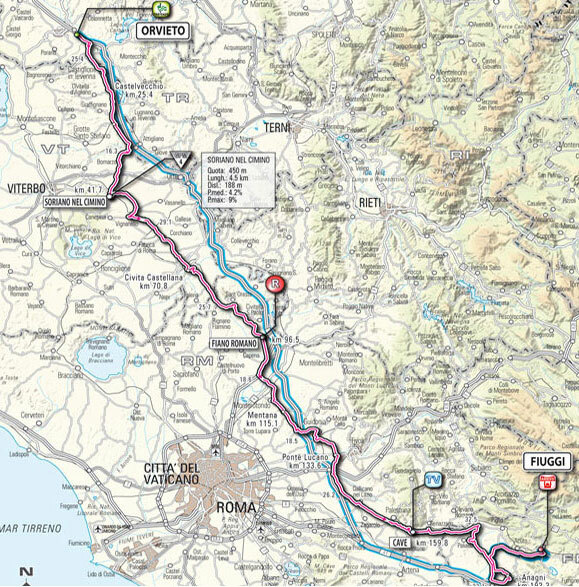 Sixty days from the start of the 94th Giro d’Italia (May 7 to May 29, 2011); RCS Sport is required, in compliance with the UCI (Unione Ciclistica Internazionale) Regulation, to supply a complete list of the teams which have been invited to take part to the event. 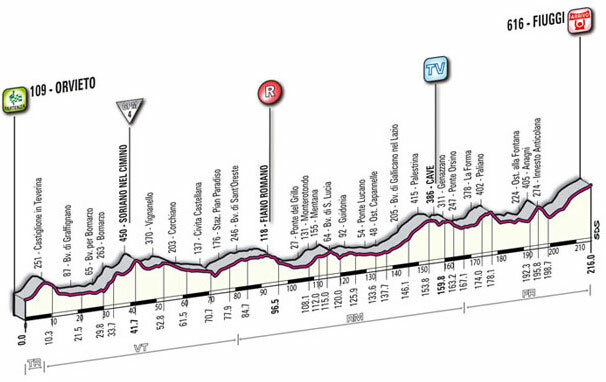 Consequently, the following 18 teams belonging to the UCI ProTeam category having the right and the duty to participate, will line up on the starting line, i.e. 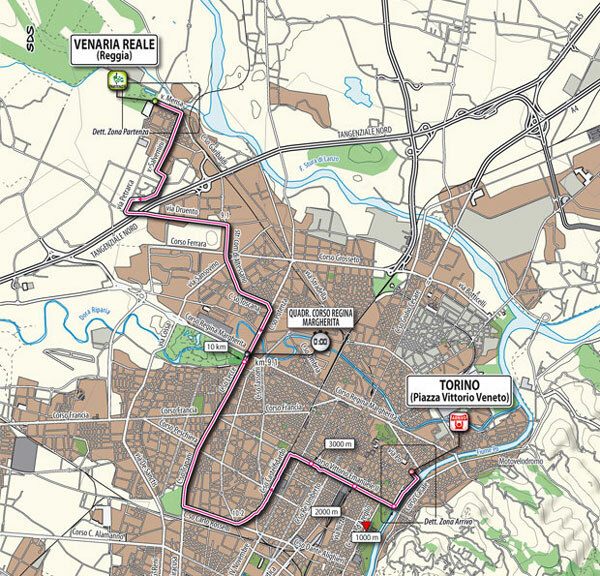 Each one of the 23 teams will be allowed to align 9 athletes for a total amount of 207 competitors at the start. 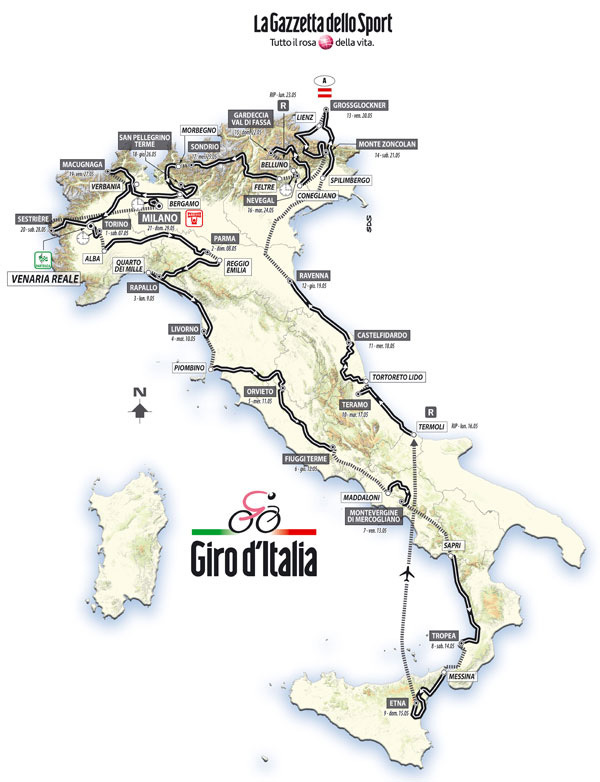 All the mentioned teams are recorded in the Biological Passport Program and are kindly requested to supply within the deadline of April 7, 2011, the list of the 12 riders among which the participants to the Giro d’Italia will be selected. RCS Sport-La Gazzetta dello Sport wish to express their gratitude to the UCI for granting the derogation to outnumber the limit of 200 competitors, and are available to cooperate with the international organization as regards safety and also to investigate into the pending cases regarding the fight against doping, as far as both teams and athletes are concerned.